Welcome to our new Mars Express blog platform (the venerable and hugely valuable MEX blog archive remains available in the Lifetype platform here) where we’re delighted to kick-off publishing with our a report on Mars Express’ support to Curiosity’s arrival at Mars. On 6 August, NASA’s Mars Science Laboratory (MSL) mission will conduct a spectacular landing to deliver Curiosity – the largest planetary rover ever flown – onto the Red Planet. ESA’s Mars Express will support the mission’s progress, recording crucial flight data right until ‘wheels down’ on the alien surface. At around 07:10 CEST, Mars Express will point its MELACOM communication antenna towards the trajectory of NASA’s MSL and start recording its arrival at the Red Planet early in the morning of the 6th. The data will provide an important and potentially crucial back-up to NASA’s own data and will help reconstruct the entry profile; MSL is also being tracked by NASA’s Odyssey and Mars Reconnaissance Orbiter spacecraft. Furthermore, several of ESA’s ESTRACK ground stations – the massive 35m deep-space antennas at Cebreros, Spain, and New Norcia, Australia – will also be involved. There’s a nice web report today in the main ESA web portal (see “ESA’s Mars Express to support dramatic landing on Mars“). For a fuller, more detailed technical overview of Mars Express involvement in NASA’s historic mission, click on the ‘Continue reading’ link below. In the next two weeks, we’ll provide regular updates here in the blog as the Mars Express team at ESA get ready for landing. And don’t miss NASA’s great ‘7 Minutes of Terror video’! At NASA request, ESA teams are preparing to provide three levels of support involving Mars Express. The first, ‘MSL Support’, essentially sees Mars Express tracking MSL during the entry, descent and landing (EDL) phase – one of the most critical phases in the mission. This will run from just before atmospheric contact to touch down, and comprises using the Mars Express Lander Communication (MELACOM) radio system – initially flown to enable communication with the Beagle lander – to receive so-called ‘open loop’ signals transmitted from MSL during EDL. “This means that ESA won’t demodulate the signal or interpret any of the bits; we’ll simply record what we “hear” in the UHF radio band (similar to the one used for terrestrial television) , store it on board – in two separate memory locations for redundancy – and then forward the recording back to Earth,” says Michel Denis, Mars Express Spacecraft Operations Manager at ESOC in Darmstadt. “It’s interesting to note that, due to characteristics of the Mars Express MELACOM radio system and antenna, as well as the geometry of the paths between Mars Express, MSL and Mars, our spacecraft can ‘listen’ to the MSL signal with good sensitivity during a relatively wide period from approach to touchdown, helping improve the chances for successful signal receipt,” says Denis. The recorded signal will be valuable to NASA when reviewing the entry profile post-landing; it may also become much more important if any non-nominal situation develops, enabling NASA engineers to better understand and characterise what’s happening. ESA’s recording will also help reduce risk of missing this information; two other spacecraft – NASA’s Mars Reconnaissance orbiter (MRO) and Odyssey – will also be ‘listening’. But if either one were to experience a technical issue during EDL, the Mars Express recording could become critical. The second level of support comprises a regular series of Mars Express-to-Curiosity communication passes (roughly every few months) in the next two years. These would be very similar to the orbit-to-surface communication checks regularly performed by Mars Express with the ‘little’ rovers, Spirit and Opportunity, from 2004 up to now. These relay passes were intensified in 2008 to test and validate Mars Express’ ability to communicate with NASA’s Phoenix lander. Now, maintaining a functional capability to relay signals to and from Curiosity by Mars Express will provide a useful back-up to NASA’s own relay orbiters, MRO and Odyssey (and, after 2014, Maven). Again, this is an excellent way to reduce risk. With the small number of flying assets around Mars, l’union fait la force (unity makes strength). The third level comprises, simply put, keeping the Mars Express team at ESOC and the mission ready to serve as a relay platform should NASA so request, possibly as often as once or twice a day, should it happen that NASA are focusing on re-establishing the functionality of their own orbiters. Hopefully this will not be required, but, for this particular scenario and more generally for routine exploitation, it is ‘the spacecraft operator’s duty to be ready to cope with the unknown’. “This could entail diverting Mars Express from its regular science-gathering mission to serve as a critical in-orbit link between Earth – either our ESTRACK stations or NASA’s Deep Space Network, DSN – and Curiosity on the Mars surface if needed,” says Denis. Who’s listening to Curiosity’s arrival? Here’s a summary of who’s listening to the MSL EDL on 6 August. NASA Odyssey – In orbit since October, 2001. Odyssey is capable of providing the so-called ‘bent-pipe’ signal relay service, effectively catching the MSL signals via one antenna and relaying these simultaneously back to NASA’s DSN stations on Earth via another antenna. Odyssey is the only spacecraft at Mars that can do ‘bent-pipe’ relaying. 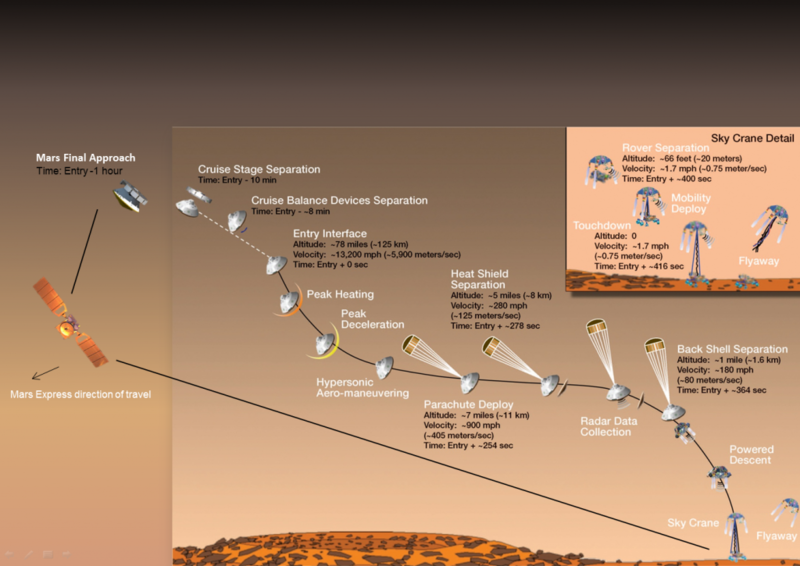 It will provide NASA with the first confirmation of MSL’s touch-down on Mars. Odyssey will begin receiving transmissions from MSL only about two minutes after atmospheric entry, and continue relaying information up to about a minute after landing. NASA Mars Reconnaissance Orbiter – In orbit since March 2006. MRO is not designed for immediate data signal relaying; and so it will be employed, like Mars Express, to provide ‘store-and-forward’ relaying. It will point toward MSL’s entry trajectory to record EDL signals, store the data on board, then point back to Earth to download. The key difference with Mars Express is that MRO can decode and interpret the telemetry and events sent via UHF radio during EDL, while Mars Express can only receive the radio signal and record the variation of its frequency due to the relative motion (Doppler effect). ESA Mars Express – In orbit since December 2003. Mars Express can also provide ‘store-and-forward’ relaying using its MELACOM radio system. On 6 August, it, too, will point toward MSL’s entry trajectory to record EDL signals. Its recorded signal data will be sent back to Earth via ESA’s 35m deep space antenna at New Norcia, Australia. In order to maximise the chances of bringing it fully to Earth despite, say, possible bad weather or a minor ground station glitch, the recorded signal will be sent to Earth twice via the New Norcia station (NNO), and once again a few hours later via ESA’s other 35m deep space antenna at Cebreros, Spain (CEB). On 6 August, the geometry of the Mars Express orbit and the MSL EDL trajectory combined with the geography of the landing zone at Gale Crater all dictate that Mars Express will best be able to track the MSL signals during the early and mid-part of entry, descent and landing phase. Mars Express will slew to point toward MSL and start listening at 07:10 CEST. “We will follow the trajectory of MSL by steadily slewing our spacecraft and its UHF antenna to keep it pointed at the NASA mission,” says Denis. Confirmation of touchdown is expected directly via Odyssey at 07:31 CEST, and Mars Express will record MSL signal data between 07:10 and 07:38 (all times subject to change). Once complete, Mars Express will slew again to point toward Earth and transmit the recorded data to ESOC via the Agency’s 35 m-diameter deep-space antenna in New Norcia, Australia. The data are expected around 08:40 CEST and will be immediately transmitted to NASA. The ESA will not issue any sort of confirmation on the successful landing or otherwise until NASA have announced it. “Toward the actual touch down, due to distance and the crater geography, Mars Express’ ability to catch the signal will become marginal; Mars Express will be by then far away, more than 6600 km and very low above MSL’s horizon,” says Denis. The Mars Express team at ESOC will ensure that recording continues 5 minutes past the expected touch-down time, but the signal may fade at the end. On 6 August, the Mars Express team will be on console in the MEX Dedicated Control Room at ESOC starting at 05:00 CEST. The team will provide a series of voice-loop and email confirmations that everything is ready to NASA’s MSL flight team at JPL leading up to EDL. All commands and other information will have already been radioed up to Mars Express and the spacecraft will perform its recording and relaying autonomously. This text from the MSL PR kit; we’ll get an update from the ESA project manager early next week – Ed. MSL will also transmit in X-band during EDL. This will confirm the initial events before Odyssey is in view of MSL. Due to the large distance Earth-Mars (250 million kms on 6 August), these transmissions will be simple tones, comparable to semaphore codes, rather than data. The NASA Deep Space Network will listen for these direct-to-Earth transmissions. But Mars, like the Earth, rotates around its polar axis… and Earth will ‘rotate’ out of view of the spacecraft, setting below the Martian horizon, part-way through the descent. 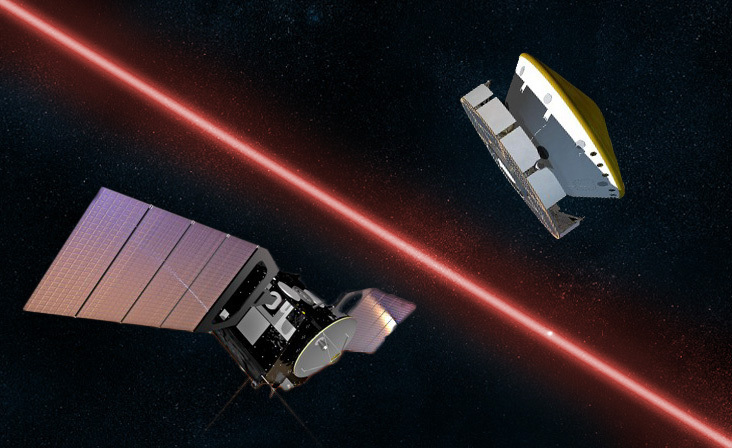 As a result, the X-band tones will not be available for confirming the final steps in descent and landing, hence the critical role of the three orbiters toward the end of EDL. In order to maximise the chances of collecting absolutely all information on this direct-to-Earth path, though, NASA have requested ESA to perform ‘open-loop’ recording of the MSL X-band downlink using the Agency’s 35m deep space station in New Norcia (NNO), in parallel to the tones reception at the Canberra DSN station, also located in Australia. This long-range recording by NNO is, in principle, very similar to what Mars Express will do in the UHF band at Mars, ‘locally’ so to speak. The New Norcia station, also on duty for Mars Express telecommanding, will be overbooked at that very hour. So, the station operators at the ESTRACK Control Centre at ESOC will juggle with the multiple receiving chains available at the station, tuning some to the MSL frequency while another one handles the MEX downlink. They can swiftly swap from one channel – MSL live – to the other one – MSL replayed via Mars Express – within a matter of minutes. Hot moments in perspective for the station operators as well! If all goes as planned, and once NASA have confirmed Curiosity’s safe arrival on the surface, ESA’s Mars Express team may be able to process the recorded signal stream to visualise the expected speed deceleration profile (and compare it to the expected one) by shifting it into audio frequency range. Since the radio signal will vary in intensity and tone during EDL, the processed signal will provide an audio recording of MSL’s entry and arrival at Mars. Listen to the Mars Express 2008 recording of the Phoenix EDL here – Ed.